Two live songs that didn't make the discography CD (the studio versions of these songs are on the Discography 2xCD, but not these live versions). 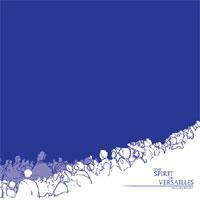 This was supposed to be an exclusive record for the Spirit Of Versailles reunion show in June 2005, but the records didn't show up until the week after the show, thanks to a certain mastering place's slow turnaround time. First pressing (June 2005): 300 copies on white vinyl; Second pressing (May 2008): 229 copies on heavywight blue vinyl.